Milkfish aquaculture in the Philippines has recently expanded from the traditional culture in brackishwater ponds and freshwater pens to marine cages and pens. Furthermore, it has evolved from extensive (low stocking density, no supplemental feeding) to intensive (high stocking density with supplemental feeding) culture. Yet, the fry needed for culture still comes almost exclusively from the wild where the supply is seasonal and subjected to climatic and pollution constraints. With the ultimate goal of ensuring an adequate supply of milkfish fry to sustain its aquaculture, SEAFDEC AQD in Tigbauan, Iloilo has embarked on milkfish breeding and seed production research. In the late 70’s, wild milkfish breeders were successfully induced to spawn but the difficulty in obtaining milkfish breeders and the unreliable production of viable eggs saw the need to develop a stock of captive breeders (broodstock). After five years of rearing, milkfish spontaneously spawned in floating net cages an 1980 and in concrete tanks in 1990. Egg productivity of broodstock in these holding facilities were found adequate to support hatchery fry production. With the consistent supply of eggs from captive breeders, hatchery fry production technology was gradually generated. This technology has been verified for its biotechnical and economic feasibility. Fry from the hatchery has been raised by several fishfarmers in Iloilo, Negros Occidental and Guimaras provinces. 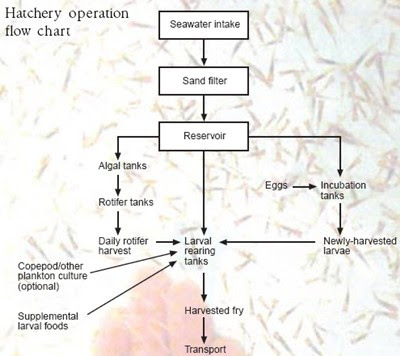 Pond production using hatchery-produced fry was similar to that of wild fry. The breeding and seed production research at SEAFDEC AQD has developed a technology that can reliably mass produce fry to meet the requirements of fishfarmers. Adoption of this technology will guarantee the sustainable growth of milkfish aquaculture in the country. Sexual maturation of milkfish begins after five years of rearing from fry. Natural spawning occurs annually in milkfish reared in floating net cages or concrete tanks. Spawning usually occurs at midnight to early morning hours following chasing and violent splashing behavior. Eggs are collected and reared in the hatchery for fry production. Milkfish broodstock are reared in 6- or 10- m diameter by 3m deep floating net cages at SEAFDEC AQDâ€™s Igang Marine Substation. While cages are easy to manage, check, clean and repair, they must be installed in areas protected from strong waves, currents, and winds. Cages are lined with a fine mesh net to retain eggs. Eggs are collected using a manually-operated sweeper. Milkfish broodstock are maintained in 10x10x2m deep or 10x25x2m deep concrete tanks with a recirculating seawater system and continuous aeration at SEAFDEC AQD’s Tigbauan Main Station. Eggs are collected using hapa net bags attached to the outflow of PVC pipe airlifts. Milkfish eggs are pelagic, transparent and with no oil globule. Developing embryo is observed 12-14 hours after spawning, and hatching occurs 24 hours after spawning (26-29 °C). Newly-hatched larvae are planktonic with a large yolk sac, unpigmented eyes and no mouth. They are stocked in larval rearing tanks. Milkfish larvae are reared in concrete tanks of 1m depth provided with filtered seawater and aeration. From two days after hatching until harvest, milkfish larvae are fed with rotifers cultured with a diet of the green algae, Chlorella sp. Artificial larval diets formulated by SEAFDEC AQD are also given as supplement. 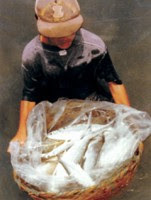 Milkfish fry are harvested after 21-23 rearing days for grow-out culture. i am stephen from india in tamilnadu, i have lease dam. i need milkfish seed for more than 1,00,00,000 nos. i need the valuable quotation. can you send the your skype id and facebook id . my contact number is – 0091-9600524678.
please do visit SEAFDEC/AQD in Tigbuaun, Iloilo Philippines or visit their website http://www.seafdec.org.ph. They sell milkfish eggs.